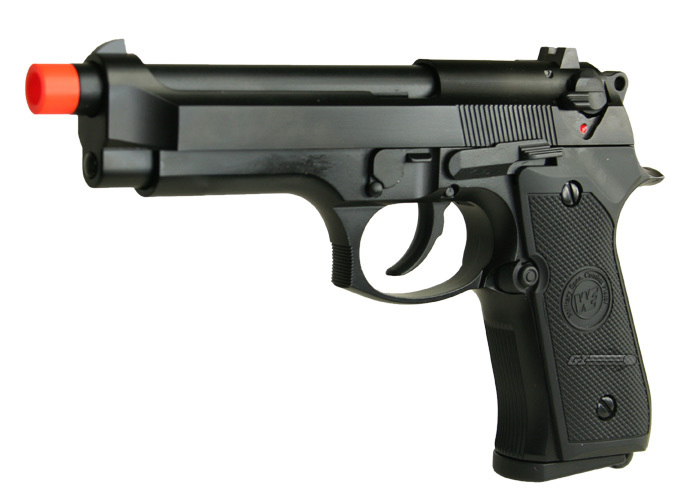 The WE M9 is a very popular pistol replica of the current U.S. military issue side arm. The control operations and break down are almost the same as the real article. The slide release, ambidextrous safety, disassembly lever, and magazine release are all functional. In addition, loop at the base of the grip allows the user to attach a retention lanyard. Great gun for great price. The The WE model does not have trademarks on the slide. This pistol gets compared to KJWÂ’s a lot, but it gives largely the same benefits at a much lower price. ItÂ’s built like a tank, fires smoothly, kicks like a mule, and feels great in your hand. Statistically, itÂ’s quite similar to KJWÂ’s, too. But, for the price, you canÂ’t beat this pistol. Keep it maintained, and it will serve you well. It spends a lot of gas, but with WEÂ’s magazines, youÂ’ll be fine. I own it, I love it, and chances are, you will, too. This gas powered M9 is astounding! The qualitty and performance of this airsoft gun is remarkable! They say it holds 26 + 1. But the magazine can hold 28 + 1 in the chamber. A must buy airsoft gun! A full gas magazine only last for about 1.5 mags. I'd recommend getting two extra magazines, a Blackhawk hoster, and dual mag pouch. I've owned this weapon a little over a year now and saying that I'm impressed, is an understatement. I've seen this gun last longer than any other M9 model I've owned. So far, ASG and KJW can not compare to the quality and performance of this weapon. The only thing I've ever had to replace for this weapon is the magazines. What mags will work in this gun? What magazines will work in this pistol?